Michael started with film and video at Kulturtuben as partner. There he was post producer for TV-series “En himla många program” and “Tornado”, he was also postproduction coordinator for the feature films “Monopol” and “Den enskilde medborgaren”. 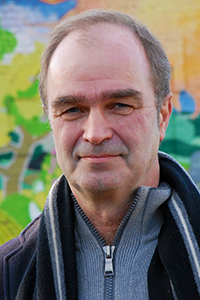 He has also worked with the post-production for Björn Runges “Om jag vänder mig om” and Ulf Malmros “Smala Sussi”. At Shoot & Post he has been post producer for “Beyond the Border” and “Eat Sleep Die”. He has also been co-producer for “100 years of evil”, “The Quiet Game”, “The Summer House” and “Tito on Ice”. As offline editor he has edited all Carl-Einar Häckners TV-transmissions from Liseberg broadcasted on SVT at new year. Michael works also as lighting designer at Kulturtuben. There he has done all their theatre shows during 30 years. The latest is the now running “30-års festen”. Copyright © 2016, Shoot & Post, All Rights Reserved.